The full splendor of the billions of stars crammed together in the core region of our galaxy is illustrated by a small dark nebula contrasting in front of it, featured in this new image shot by the European Southern Observatory (ESO). 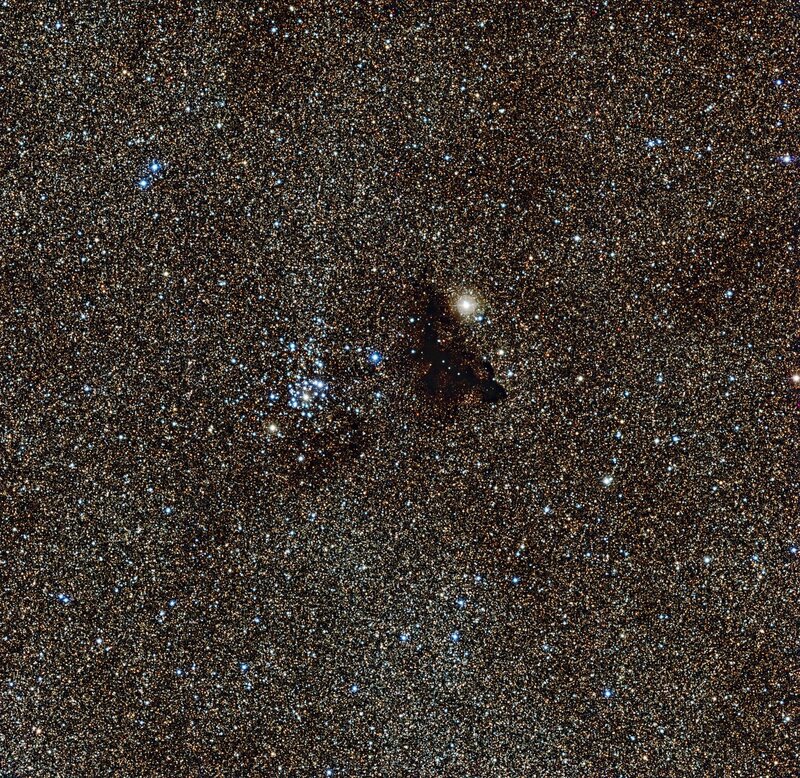 They are in an area of the constellation of Sagittarius (The Archer) that includes one of the richest star fields in the whole sky — the Large Sagittarius Star Cloud.The huge number of stars, part of our galaxy's center, that light up this region dramatically emphasise the blackness of dark clouds like Barnard 86. Barnard 86 is a dark nebula known as a Bok globule, and was first described by American astronomer Edward Emerson Barnard as “a drop of ink on the luminous sky.” This astronomer not only discovered Barnard 86, but also found and photographed numerous comets, dark nebulae, and one of Jupiter’s moons. He was the first astrophotographer to use long-exposure photography to explore dark nebulae. In a clear and high resolution image like this it can be seen that Barnard 86 sits in the foreground of the image, while previously, on smaller telescopes, it could appear as if it was a break in the stars, showing off a blacker sky behind it. This dark cloud is made up of small dust grains that scatter and block starlight, letting the region appear opaque. NGC 6520 is an open star cluster that contains hot stars that glow bright blue-white. These types of clusters usually contain a few thousand stars that all formed at the same time. The cluster is believed to be about 150 million years old now, with both it and Barnard 86 being about 6,000 light-years away from the Sun. Because of the incredible number of stars in this area, astronomers have a difficult time to observe and analyze single objects there.